I'm really not a comic book guy. I've made half-hearted attempts to be at various times and have a few issues of The Green Hornet, some Doctor Who stuff, a few trade paperbacks of essentials like The Watchmen and Love and Rockets as a result. 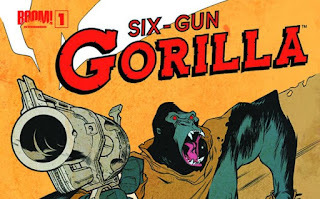 It's unlikely I'll end up actually reading Six-Gun Gorilla, but knowing it exists, and has that cover, that is satisfying in and of itself.